In August 2010, I set out on a solo hiking trip to the mountains in east Tennessee; it was the first time I left New York since arriving in January. There would be no subway trains, tall buildings, small apartments or noisy construction for a full week. I traded the subway for a car, the tall buildings for trees, the small apartment for a cozy cabin and the noisy construction for nature sounds. After arriving Sunday night, I hiked Monday on the Hen Wallow Falls trail in Cosby. My left foot felt a bit tight inside my hiking boots, so I checked it when I arrived back at the cabin. After taking off my boot and sock, I saw that the skin above my heel was slightly peeling, but didn’t look too severe. I put on a sock and enjoyed an evening indoors. The next day I prepared the hiking equipment, packed a lunch and put on my boots. I drove to the The Sinks parking lot inside Great Smoky Mountains National Park and began a hike to Upper Meigs Falls along Meigs Creek Trail. At first, the trail didn’t appear to be a big challenge; the distance wasn’t very long, and the terrain wasn’t too bad. After about five minutes, rain began to fall; I picked up the pace. At this point, I began to feel more pain as the left boot scraped against the back of my foot. 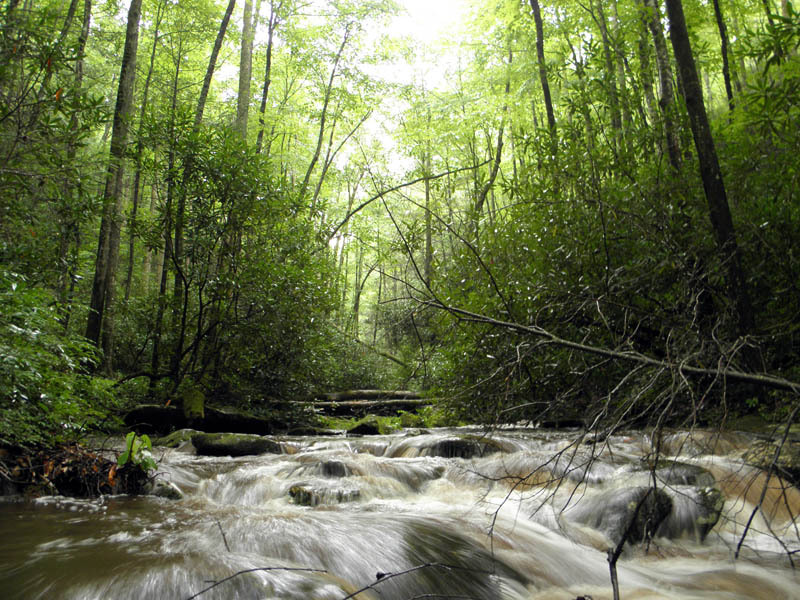 Meigs Creek sources water from Little River, branching out across Lumber Ridge and the surrounding area. This is a view of the first stream crossing near Upper Meigs Falls. After about an hour I spotted a wide stream ahead of me. It was flowing high and very fast with the added rainwater. I looked left and right for an easy way to the other side, but didn’t see any logs or large rocks. I picked up a small branch to test the depth; it went under about 1-2 feet. I threw the branch aside, put my socks in my bag, stepped in the stream, and at that moment felt a sharp pain hit my foot. It was the feeling of cold water soaking the area above my heel. Instead of turning back, I decided to walk through while taking in the tremendous pain, trying to keep my balance on the slippery, underwater rocks. I made it out on the other end. Little did I know that three more stream crossings lie ahead. I braved the waters, the heel of the boot driving into the skin on the back of my foot with every step, and made it to the falls. I had lunch there while taking in the sights and capturing some photos; the rain slowed to a sprinkle. 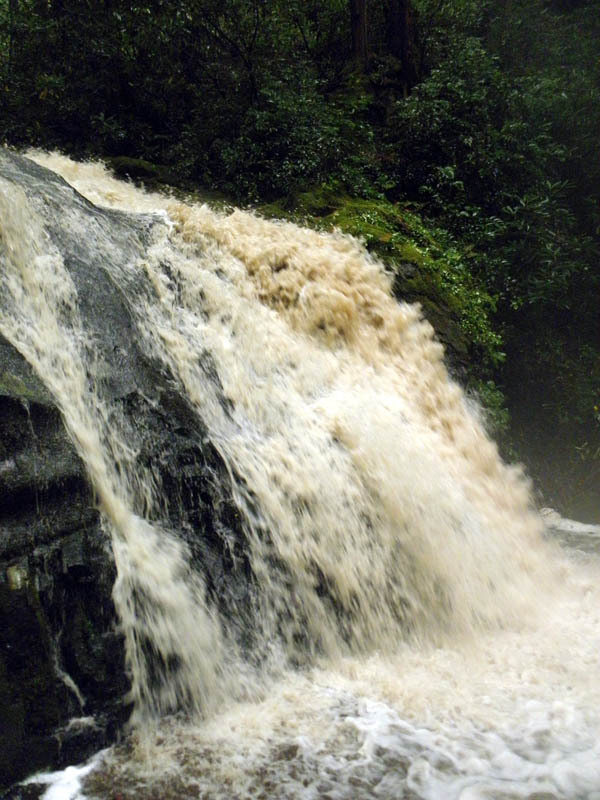 The waterfall was flowing especially strong right after the storm dumped a few hours of heavy rainfall. Before I could return to my car, I’d have to cross all four streams again, and I knew they’d all still be flowing strong. I checked the back of my foot. Just above my heel bone, it looked very red, and a few layers of skin had been stripped off. This surprised me since I didn’t think it would look so bad; I had never seen my heel so badly damaged. I discovered that the cloth had ripped on part of the boot and some sort of hard material was exposed. I documented the trek back from the falls on video using a cheap camera. It’s shaky, and at times you can hear me groan and see me wince. Each time I slipped on a rock, the boot would drive into the red area on the back of my left foot while cold water and small sticks and pebbles flowed into my legs. It hurt. The fourth stream seemed like the final stretch even though I had another mile and a half of hiking ahead of me. I took the last step out of the water and sat down on a log. I examined the back of my foot and decided to ease the pain for the rest of the trip by cutting the entire back portion off my boot. I pulled out my knife and cut down on one side, down on the other side and then sawed off the flap. The nearby stream was still running fast, and I was certainly glad to have finished that part of the journey. Arriving at my car felt very rewarding. Many families, couples and friends were walking around the parking lot earlier when I had arrived, but my vehicle was the last one left; the sun was just about finished setting. I drove to a store about half an hour away, dragging my foot on the way in. Heading straight for the pharmacy section, I picked up some bandages, other first aid items and then stopped by the meat department for a steak. Upon making it up the mountain to my cabin, I fired up the grill, bandaged my foot, prepared the steak and enjoyed a cold beer and some football from the comfort of a recliner.